Part of this stems from the use of a different kind of NAND bit cell. 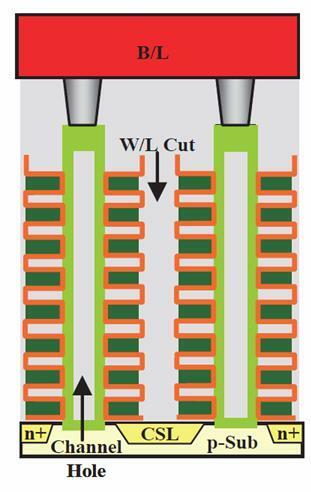 You can shrink flash cells smaller if you use a high-k gate dielectric (one with a high dielectric constant “k”) since it provides a very high capacitance (higher coupling) between the charge trap and the control gate. Capacitance decreases with process shrinks since a shrink reduces the plate dimensions of a cell’s capacitors; changing the dielectric from silicon dioxide to a high-k material helps offset this decrease. High-k dielectrics perform better with a metal control gate than with the polysilicon gate used in conventional flash cells, so some high-k designs deposit a tantalum control gate on top of the high-k dielectric. Samsung has chosen a cell type called TANOS, which stands for Tantalum-Alumina-Nitride-Oxide-Silicon. Even this is a shortened term, since the “Tantalum” is really tantalum nitride, “Alumina” is short for an aluminum-based high-k gate dielectric (usually Al2O3), “Nitride” is short for silicon nitride, and “Oxide” is an abbreviation for silicon dioxide. 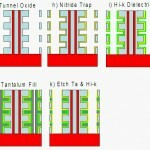 The TANOS structure combines a silicon nitride charge trap with a high-k gate dielectric and a tantalum control gate. According to Samsung this cell provides certain advantages over the BiCS cell, including faster erase speed, wider threshold voltage margins, and better data retention characteristics. The series of figures in the second and third graphics illustrate the process steps involved in manufacturing a TCAT string. It’s more extensive than the BiCS series, so I will ask for the reader’s patience. I will again advise readers to right-click on the graphics and open them in new windows, so that you can “Alt-Tab” back and forth between this blog post and a larger and clearer rendition of the graphic. 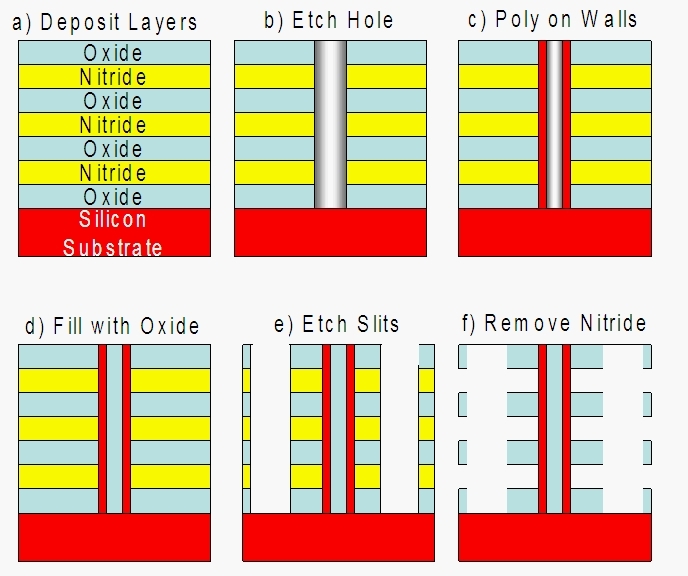 Similar to the BiCS design, the process starts by depositing multiple layers onto the surface of a CMOS wafer, (Step a in the graphic) but rather than alternating conductive polysilicon and insulating silicon dioxide layers the TCAT process begins with alternating layers of silicon nitride and silicon dioxide. That may surprise you, since both of these materials are insulators, but we will see that the silicon nitride layer is sacrificial – it serves as a placeholder and will be removed so that the space it consumes can be filled with the gate materials. As with the BiCS process, a hole is etched through all the deposited layers to the substrate. This is shown as Step b) in the second graphic. The hole is next lined with polysilicon for the channel, skipping the deposition of all the ONO layers used in the BiCS approach. This is shown as Step c) in the graphic. In Step d) the center of the hole is filled with silicon dioxide, which (I am told) gives better sub-threshold characteristics and threshold voltage distributions than a solid polysilicon channel would. This has been dubbed a “Macaroni Channel.” Although I am not aware of its use in BiCS, the macaroni channel might also appear in that approach once it is introduced. 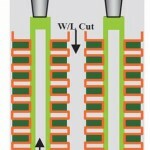 In Step f) the sacrificial silicon nitride layers are selectively etched away from the sides, leaving a structure resembling a very narrow tower with fins. 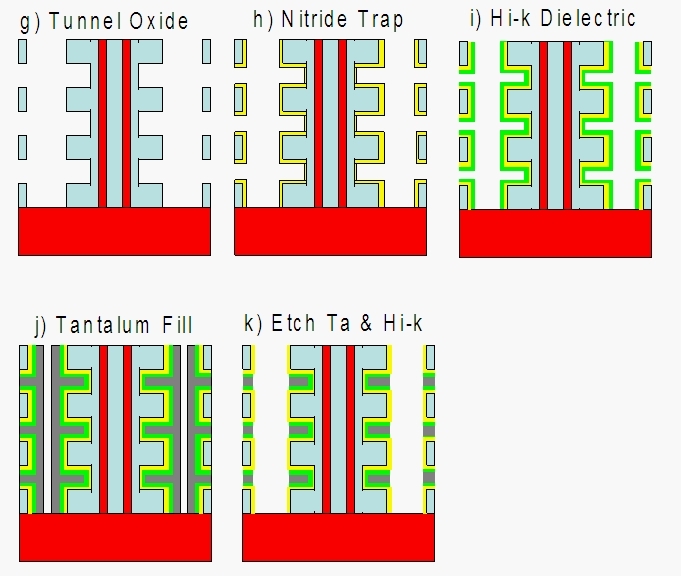 The entire tower is then coated with a silicon dioxide tunnel dielectric layer (Step g in the third graphic), followed by a silicon nitride charge trap (Step h) and then the alumina high-k gate dielectric (Step i). Finally most of the slit and all the remaining gaps in the finned pillar are filled with the tantalum nitride control gate material (Step j) which is subsequently etched out of the center of the slit along with the high-k dielectric on the walls (Step k). What remains is a vertical NAND string of TANOS transistors: The tantalum nitride plug (gray), an alumina high-k gate dielectric (green), a silicon nitride charge trap (yellow), the silicon dioxide tunnel dielectric (pale blue), and the polysilicon channel (red). To go back to the layer cake analogy I used in the prior post, we have just built a layer cake, removed all of the frosting, and replaced it with a different and more complex frosting. Either way, since the gate surrounds the channel both BiCS and TCAT are called “Gate All Around” structures. Since one of the problems presented by planar scaling is the fact that the coupling capacitance between the control gate and the rest of the transistor diminishes with shrinking processes, a big benefit of the Gate All-Around approach is that it provides a lot of surface area to couple the control gate to the charge trap. I am told that one strength of the TCAT approach is that it is less constrained in the horizontal plane than is the BiCS approach so the holes may be made smaller, resulting in a smaller die size. This is because of the number of layers deposited into the hole: The hole in BiCS is filled with three concentric tubes to form the oxide-nitride-oxide layers and then is plugged with a polysilicon cylinder. The TCAT hole is filled with a single polysilicon tube and an oxide cylinder. This is expected to allow TCAT to scaled to tighter lithographies than BiCS. Coventor has shared a video of the process of making 3D NAND that can be accessed from another post on The Memory Guy. Have a look and you will be amazed at its complexity! The next post will show how the control gates on all those internal layers are connected to the support logic, a simple job in a planar NAND that becomes a daunting challenge in 3D. This post is a part of a series called What is 3D NAND? Why do we need it? How do they make it? 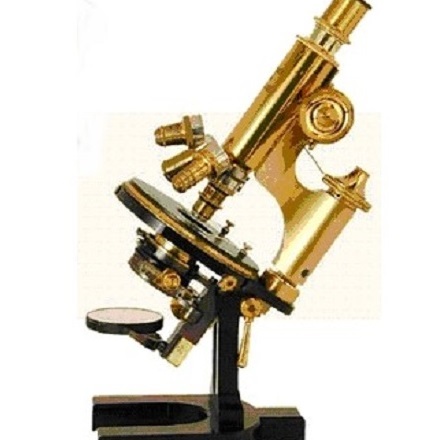 that was published in weekly segments during the fourth quarter of 2013 on The Memory Guy blog. The different sections are listed below, with a hot link to each section. Why Do We Need 3D NAND? What Is a 3D NAND? How Do You Access the Control Gates? Who Will Make It and When? 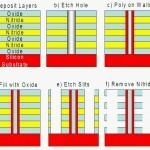 Click on any of the above links to learn more about 3D NAND technology. Great information and look forward to the next article. Excellent series of articles Jim, with just the right amount of detail. I have recommended it to many of my colleagues. Thank YOU, Don, for the compliment! I only hoped to make this really unusual technology understandable. My volunteer proofreaders deserve a lot of the credit for clarity. They hold me to that task! Thank you very much! Very helpful! I have a question pertaining to the 2nd and 3rd graphs in this post. In the 2nd graph, step f leaves with an empty space outside the poly (the place was originally occupied by nitride). But step g in the 3rd graph, it appears to me that a layer of oxide is grown outside the poly. Is there any process to deposit oxide from step f to step g. There is not mentioning in the text. My graphic skills aren’t all that good, so you may not have noticed that the existing oxide got a little bigger when the oxide was grown on the poly.